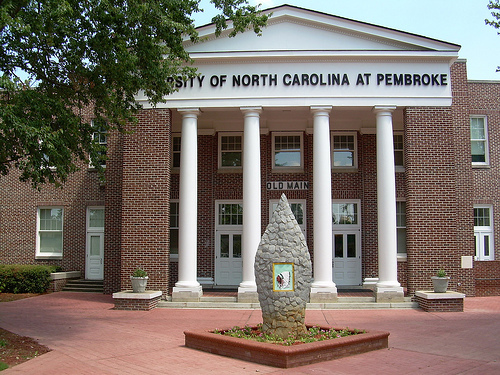 The University of North Carolina at Pembroke was established on 7 Mar. 1887 as Croatan Normal School by the General Assembly at the request of the Lumbee Indians and other Native Americans in the state. Its purpose was to train Native American public school teachers. The school enrolled 15 students in the first year. In 1911 the legislature renamed the school the Indian Normal School of Robeson County, then changed it in 1913 to the Cherokee Indian Normal School of Robeson County. This name remained until 1941, when it was changed to Pembroke State College. Until 1953 the school was the only state-supported, four-year college for Native Americans in the nation. In 1969 the General Assembly granted the institution regional university status as Pembroke State University. Three years later it became part of the 16-campus University of North Carolina System. Effective 1 July 1996 the school officially became the University of North Carolina at Pembroke. The University of North Carolina at Pembroke is a regional public university that offers more than 50 undergraduate degree programs and 14 graduate degree programs. The student body of more than 4,300 students is considered one of the most diverse in the country. The university's collection of American Indian art and artifacts in its Native American Resource Center draws visitors each year from across the nation and abroad. Its Givens Performing Arts Center-the cultural center of the region-is home to performing arts series and local events. A Regional Center for Economic, Community and Professional Development provides a variety of services, including research planning, assessment, consulting, conference design, and customized training. The center also offers a variety of programs in community health, rural education, small business consulting, public safety, and management development. David K. Eliades and Linda Ellen Oxendine, Pembroke State University: A Centennial History (1986). Clifton Oxendine, "Pembroke State College for Indians," NCHR 22 (January 1945). Adam. 2007. "Old Main." Online at Flickr at http://www.flickr.com/photos/adamhgs/3678470481/. Accessed 07/03/2012.